or the hat that got frogged not once, not twice, but 4 times....! In the beginning, there was the yarn. 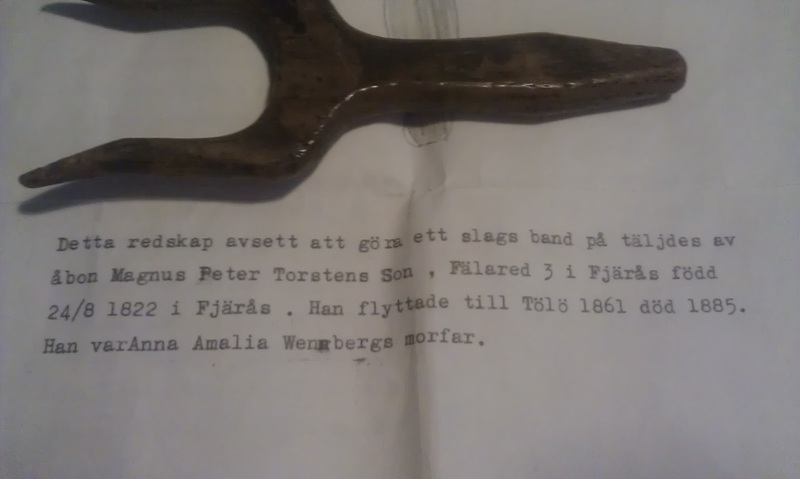 I found this at Ullcentrum's stand at the Syfestivalen fair in february 2011. It had my friend K's name all over it. I wasn't sure what I was going to make from it, but I was certain it would be something for K.
Round about August, she told me she needed a woolly hat for the coming winter. Great, I said, I got just the yarn for it, and started to look for a pattern. I wanted something that was knitted with cables, and also was a bit slouchy, so went crawling through Ravelry for berets and tams and suchlike. I found the Flavia. It was just what I wanted, with its little serpentine cables weaving in and out, enough slouch but not really a beret. I cast on for the first time and immediately got it wrong, there is a lot of counting to do with the pattern from the beginning, if you forget to use markers, like I did. Knitted the whole of the brim and was just about to start on the cabling when I realised my mistakes. Rip it up, start again. This time I used markers for each section of the pattern to simplify counting each stitch to match up with the cabling in the body of the hat. All went well, it is a fun knit with all the little cables swirling around, in and out of eachother. About half way I started getting suspicious that the hat was getting to big. I knitted on in the belief it would be alright on the night. Until I was almost 3/4 done, then it was becoming quite obvious that the hat was going to fall down around my ears and neck if I tried it on. And it did. I gave up the yarn. By now there had been another Syfestival fair, and I had found some more delicious yarns, this time from Islandsgarn. It is called Léttlopi, and is a wonderfully squishy aran-weight Icelandish wool yarn that was sold really cheap at the fair. I bought red, blue, a heathery pink and a lilac purple, completely without projects in mind. Since this yarn was thicker, I needed a new pattern. I had previously favved The Druidess Beret when I was looking for patterns and decided to give it a try. This time I used markers from the beginning, even if this one wasn't quite so dependent on counting in the rim. I also bought new needles to fit gauge. I thought. 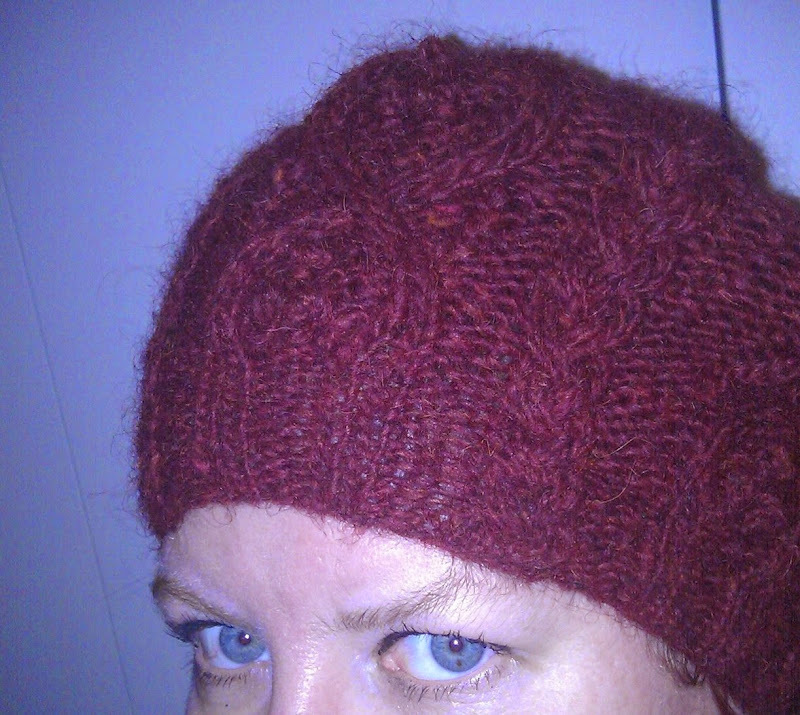 The thicker yarn, and slightly simpler pattern made this hat a really fast and fun knit. About half way into the body of the hat I realised I hade made a serious mis-thinking in needle size and had knit with the wrong size needles all the way. Started again with the right size needles ( 4 & 5mm). Knitted all the way to the end. Blocked. Too big. Getting desperate, and time starting to be a factor since it was now November, I decided to simply cut one section of the repeating pattern. Knit 5 sections instead of 6. And that finally did the trick! It felt better even as I was knitting, and was even able to try the hat on K before I finished it to make sure. 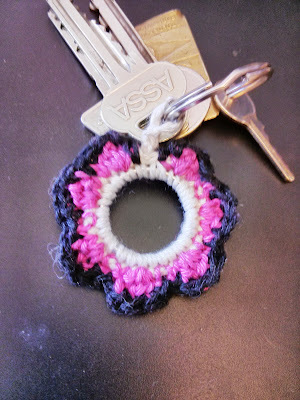 Then I was able to finish it, block it and wrap it up for K for Christmas. Luckily we have had a quite mild winter so far so she hasn't been freezing her ears off in waiting. I believe she was really happy with it, but last I saw, her daughter has hi-jacked it for herself. Me in the finished hat, but before blocking. Awful pic but there you go. What I learned from this hat: The Importance Of Knitting Swatches. 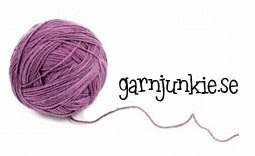 Gauge may not be vitally important in every thing I ever knit, but, in things that should fit something specific, like a head, it really is important to take the time to knit that little square up before you start on the project itself.